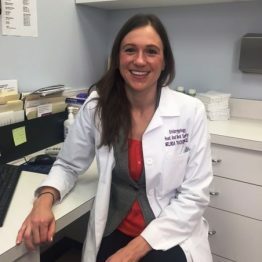 Dr. Thacker is initially from Wisconsin, where she attended both college and medical school, and then matriculated to Baylor College of Medicine in Houston, Texas. She completed an internship in General Surgery in 2008 and a residency in Otolaryngology-Head and Neck Surgery in 2012, both at Baylor College of Medicine. She then obtained advanced endoscopic sinus surgical training at St. Elizabeth’s Medical Center in Brighton. She dedicates herself to providing personalized care to every patient using the latest in evidence-based research. When she is not with patients, she spends time with her husband and their two young children.